So first let me start out that if you look at my profile I’m about as much of a hefeweizen fan as I am a fan of DQ's Peanut Buster Parfait, and I HATE the parfait. Sounds crazy I know, but it makes me sick and peanuts are a worthless nuts unless taken from the shell. But, I decided if my reviews are gonna be worth the screen they're written on then I need to dabble in to all styles. I've been sluggin hefe's the past few weeks so here goes. If you wanna check out some info on Ayinger check out a past review here. 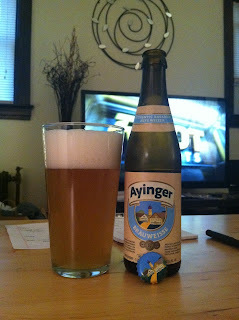 This was Ayinger Bräu Weisse. I'll start by saying the label and cap really make me feel warm inside. I like when a company puts some effort in the cap rather than the standard cap for all their brews, so points for that. Now the beer poured a nice farmy straw color which matches the artwork, with a nice frothy head. I've read that this beer on tap doesn't have the same effect, so for all those Ayinger reps reading this, might wanna educate your customers of proper serving psi. The smell is of citrus and slight banana, and the taste is the same with an addition of vanilla and some mild spice. As most hefe's this has that velvety mouth feel that relates to the style. This went down fast and I could probably drink a dozen in a row. Really good summer beer, and would be quite refreshing after doing some lawn work. The ABV is 5.1% and price was free for me from a beer trade at work. I traded some Magic Hats and a couple Yueng's, so I definitely made out on the deal, but I'm assuming 5-6 bones a bottle. Decent deal on a session-able hefe.